I love to decorate with fresh flowers. Have several pink rose bushes in my garden, so usually have flowers on display all summer. Even one bud in a vase makes a big statement. Below are photos of some of my roses in thrift store vases. These just might be some of the last roses of the season. The light pink roses are perfect for a shabby chic decorating scheme. My mother just came to visit me in Massachusetts, so of course we had a wonderful time checking out the thrift stores and flea markets. 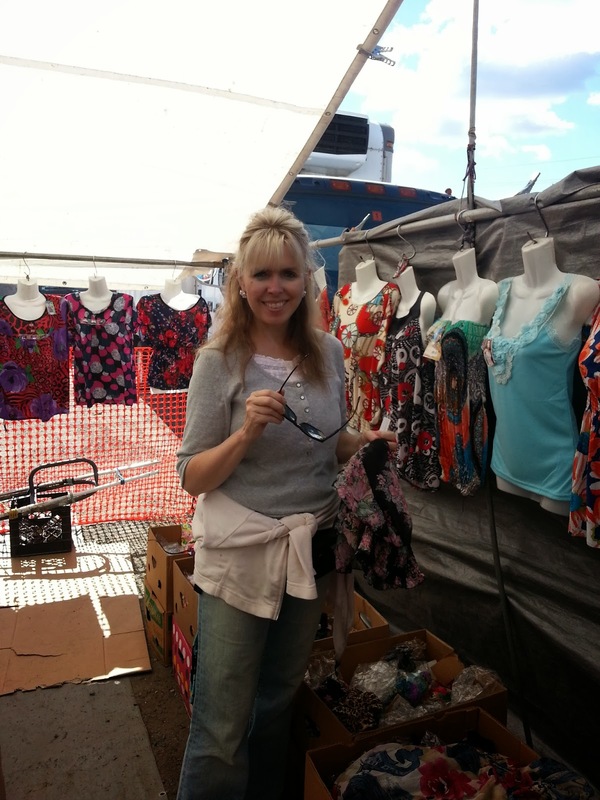 We had so much fun at the Puerto Rican flea market in Salem, NH, which is held every Saturday and Sunday. As you can see by all of the stuff in my hands, we picked up a lot of goodies! My mom and I especially love the costume jewelry and hair accessories. I also picked up some really cute tops as well. I have a huge collection of doilies. They are easy to find in thrift stores. I have picked up several. Most of my vast collection however is from my mother whom loved to crochet! 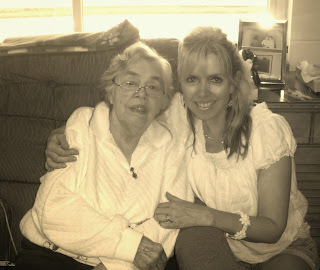 In fact she crocheted doilies well into her 80's. Love my Mama who is now 89 years old. Lace edged doily on back of arm chair. It is fun to decorate with thrift finds. Below are some pictures of vintage nightwear hanging on hooks in hallway, a collection of vases and a few other photos of lovely clothing hanging in the laundry room. Aww....so soothing! Thrift stores are great places to find craft space items. I have stocked my craft space with wrapping paper, ribbons, sewing items etc. Just love having a dedicated space to get creative. The two vintage crystal lamps were fund at a yard sale for $4.00@ piece! The wooden box divider was found at a thrift store. Handy for my stamp collection! Like my daughter, I love Marilyn Monroe memorabilia! Thrift stores are great places to find everything "Marilyn". Am visiting Cat this week, and loved how she hung a Marilyn poster (that she found thrifting) on the back of her door. I couldn't resist snapping a photo. Am also posting pics of a few Marilyn books that I have found at thrift stores. Also, purchased a small Marilyn poster for .50 cents. It provides a little touch of glamour at my bedroom vanity! Happy Thrifting everybody! Marilyn poster on the back of Cat's door! Pretty Marilyn poster just seems to add a touch of glamour to my vanity! Pretty book with black & white photos! Bought this Marilyn book for $1.00. Fell in love with the beautiful color patina on the cover. Here is a sampling of some of the thrift store jewelry that I found over the summer. The jewelry in the top photo was all found during a quick stop at a thrift store in Eureka, Ca. Some items were 50 cents. Some were $1.00. Two of the necklaces were $1.99. What a great thrift day! The jewelry section is the first place my daughter and I head to at the thrift store. We usually always find treasures! All kinds of romantic bobbles! Pretty shell bracelet has a bohemian vibe! I never pass up a pretty rhinestone necklace. My old vintage record player is one of my absolute, most favorite thrift store finds. My mom and I had been searching for a record player for years, and finally we found this one! I loved the neutral color too, as it goes with any kind of decorating. Over the years, I've collected quite a lot of record albums. There is always an abundance of records in thrift stores, and searching for them never seems to get old. My mom also has her own record player, so we both are always on the lookout for good music. We share our music with one another too, which is really nice. The thing I love about record players is that there is a certain vintage quality-like sound that makes the music sound extra beautiful. My mom is the sweetest, and recently picked up this Doris Day album for me; not only is it my style of music, but I think the album cover itself is so pretty too. Added a few pretty album's to Cat's blog post. More album covers with beautiful graphics. So easy to find at thrift stores. All of my curtains are thrift store finds. Here is a pic of the vintage lace curtains I made for the sliders in our little vacation home. I purchased several mismatched pink and white lace panels at a thrift store for $1.00 @ piece on half-price day. They were not long enough, so I re-designed them. Some sewing was involved. Love the result. Also, I had my windows open on Friday and all of my curtains were blowing in the breeze. So peaceful! Here are some pics. Happy Saturday everyone! Love the windows open in the summer and early fall! Found 6 sheer panels for $2.00 @ piece at thrift stores. Perfect for the family room! Love fresh flowers in our house. Here is a pic of an array of flowers in thrift store vases. My favorite is the light blue and white clay vase. Still have some light pink roses in our garden but I think we are drawing close to end of the season. The darker roses were purchased at supermarket. Love love flowers! Light pink roses from the garden in thrift store vase. The silver tray is from a thrift store too! Last year I found an old Audubon calender in the thrift store. Audubon was an amazing artist! The calender has such beautiful prints in it; and since I'm such a bird lover/bird watcher, I decided to put up 4 of my favorites over the painting that is mounted to the wall in my bedroom. After a while, or when I get bored, I'll probably exchange the prints for some others in the calender. There are so many to choose from. Although this is a calender from 1995, I'm sure I'll be hanging onto it for a long time! Also, it just so happens that I got to use the calender at my desk last year. How lucky that the days in 1995 fell on the same days in 2012! You never know what you'll find thrifting! Perfume bottles, mirrors and pics......all make for the perfect bedroom vanity. Have found beautiful vanity ware at thrift shops and flea markets. I love to change mine up. Here are 2 different versions. Which one do you like best? Took the back off of my planting table & added a marble top. Voila! Have a wonderful Wednesday everybody! I love really pretty vintage pins. Most of these are from thrift stores, with the exception of the bumblebee and the star (both from my grandmother); along with the cardinal pin (from my uncle). They're great for decorating my apartment - either attached to a bulletin board, next to a picture frame, sitting in a dish, etc. - or you can always use them to revamp an outfit. on dresses that are a bit too big/need to be taken in. This one is from a flea market. I was told it is from the early 1900's. It was reverse-engraved from the back of the pin. There is so much detail - it's amazing! There is a huge thrift store right off Broadway in Eureka, CA. I always stop when we are on our way to the coast. The first time I went, I found 4 cups with gold etched printing with the caption: "By Appointment to His Majesty The King of Sweden". Love these cups, especially in light of our Swedish heritage. Every time I stop, I am lucky enough to find a few more scattered among the housewares. Over time, have found 15 in total, and just love them. Swedish Royal Cups add to vintage vibe of my shabby chic kitchen!